Fantasy Flight Games’ Euro Classics series is one of the best developments in boardgame publishing in 2015, as they’re bringing back some of the best German-style games ever created and doing so with updated graphics and better packaging, making them accessible to all of the players who’ve come to the hobby in this recent explosion of popularity. Following the release this summer of the new version of Tigris and Euphrates, Fantasy Flight has now brought out a much-improved edition of Samurai, one of the top twenty games I’ve ever played, and one that has the rare benefit of playing as well with two players as it does with three or four. 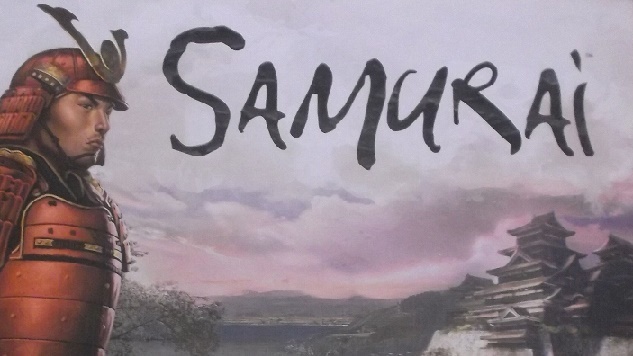 Samurai, from the Prolific Reiner Knizia—the man has designed so many great games, you can’t discuss him without calling him “the Prolific”—is a very simple game that, like many Knizia titles (including Tigris and Euphrates), has math at its heart without wearing that math on its sleeve. Players compete to seize control of neutral tokens on a small board, the size of which depends on the number of players, by placing tiles of varying strengths and influences on empty hexes. There are three types of tokens—castles, rice paddies, and buddhas, two of which have changed since the first edition—and players attempt to capture those tokens by placing tiles that influence specific token types or that influence all three at once. Once a token’s hex is surrounded, the player whose adjacent tokens have the most influence on that token type gets to take the token. The tokens’ locations on the board change each game; there’s one space that has three tokens, one of each type, and the remainder are placed by the players, one at a time, until the board is filled. Most tokens stand alone on their spaces, but there are a few two-token spaces (the tokens can’t be of the same type) as well as the central “edo” space with all three. Each player starts the game with the same twenty tiles, but only has five tokens in his/her active hand at any point; you can begin the game with randomized hands, or can allow each player to choose his/her starting hand. Eighteen of the twenty tiles bear numbers on them that represent that influence or strength mentioned above. Each player has nine tiles that show a specific token type, three in each, showing strength 2, 3 and 4 applying to buddhas, rice paddies or castles specifically; these tiles have no effect on tokens other than the ones they depict. Five more tiles show samurais and influence all three token types equally, with one tile of strength 3 and two each of strength 2 and strength 1. On a turn, a player may play only one of these tiles on an empty hex space, and once placed the tile can’t be moved, with one exception, the “move tile,” which, when played, allows a player to pick up a used tile from the board and relocate it to a new, empty space. Each player has just one move tile, so deploying it is one of the game’s many key decisions. A player’s stack of tiles also contains five “fast” tiles, bearing a small red symbol with the Japanese character ? (hayaidesu, meaning fast), so-called because a player can play them in addition to any regular tile on a turn and may even play more than one on a turn. Three of these tiles are ships that are played on sea hexes adjacent to land, two of strength 1 and one of strength 2. These influence all token types as the samurai do, but may only be placed on sea hexes and are the only tiles that may be placed there. The other two fast tiles are the most interesting and strategic in the game, because they allow you to really stick it to your opponent—and knowing your opponent has them will inform every choice you make until those tiles are on the board. 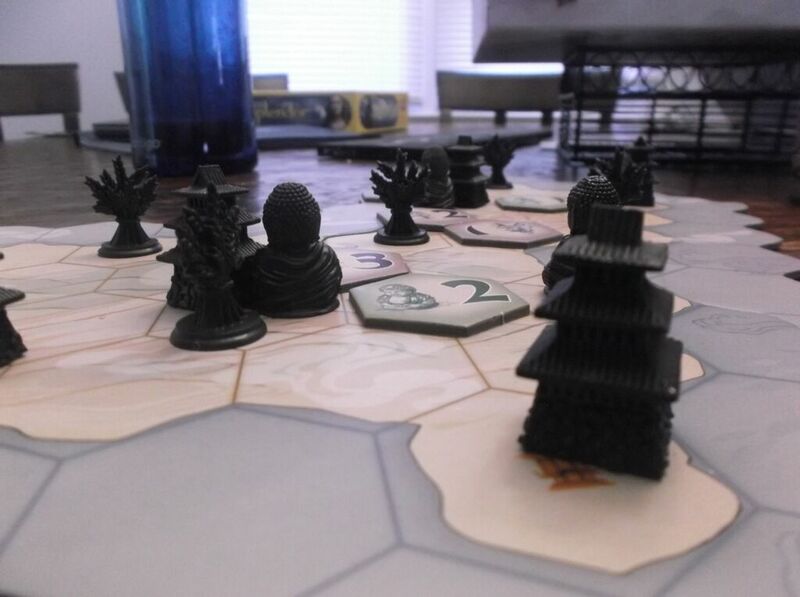 One, the ronin tile, works just like a strength-1 samurai tile, but because it’s a fast tile can be played in addition to a regular tile on a turn, so when a token has only two empty spaces adjacent to it, you can play a normal tile and the ronin to surround it and capture the token(s) without giving your opponent a chance to respond. The other tile is called the “switch” tile and allows you to exchange two tokens on the board for each other—a buddha for a castle, for example—which can allow you to sneak in and steal a token that your opponent had surrounded with his tiles influencing the token you just moved. The only rule is that you can’t switch tokens to put two of the same type on any space, so the edo space is unaffected by the switch token. This, like the ronin tile, allows for a sort of sneak attack; an opponent may have laid several tiles around a space, believing he’ll capture that token, but by switching the token to another type you may render his tiles useless and steal the token with something as small as a strength-1 tile of your own. If any player gains a majority or plurality of two of the three tokens, s/he wins the game. If, as frequently happens in four-player games, no player reaches that condition, then the scoring gets just slightly more involved. If two or more players each have that plurality in one token, then the player with the most captured tokens from the other two types (in which s/he doesn’t have the most) is the winner. If there’s still a tie, then the player with the most total pieces across all three types is the winner. The new design and packaging from Fantasy Flight are a huge improvement over the earlier edition, with a smaller square box, brighter colors, and more portable board. The change from the old token types may jar players of the original edition or the very strong iOS app. 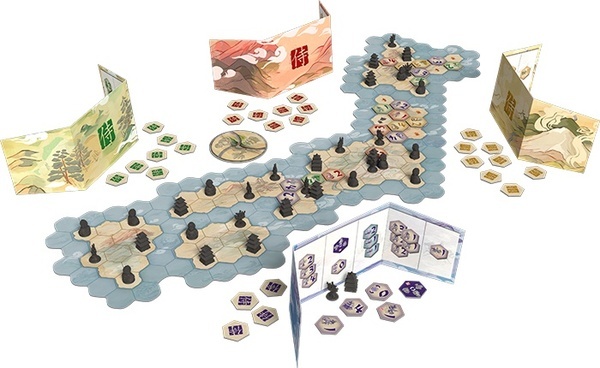 Including setup, a two-player game of Samurai can take under a half hour, and a four-player game around 45 minutes, and while the box indicates it’s for ages 14 and up, an eight-year-old could understand the basic rules, if not the advanced strategy brought about by the ronin and switch tiles. It’s truly a Euro Classic worthy of the series title and should be a staple of any serious boardgamer’s collection.